This is polycarbonate and tinted to block the glare of the sunlight overhead to offer a cool shaded area underneath. The fibres are also UV stabilised to block out those harmful UV rays. However, the sun panels have sliders fitted meaning they can be opened to let the sun shine in when it’s sunbathing time. 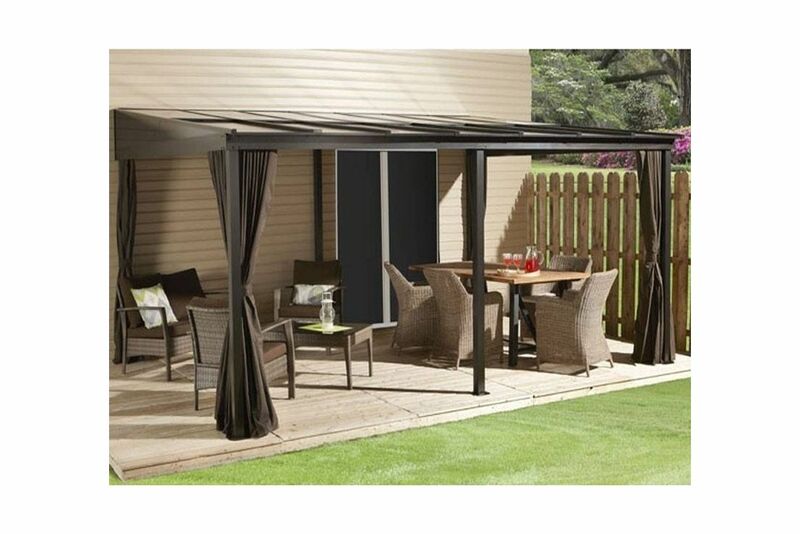 This novel feature gives this Wall Mounted Gazebo maximum flexibility to facilitate your outdoor living and add style to your outdoor space. Your purchase also comes with a set of spun polyester, lined side curtains that run on smooth rails and can be tied back to the frames or removed entirely when not required or for cleaning purposes. You also get a set of mosquito nets as an added extra. The only thing you don’t get is the furniture to put under it! For further information please call our Showroom in the Midlands.